The pool pump motor is what powers the pump to pull water from the pool, push it through the filter and back into the pool. If the motor goes out, then your pool pump stops working and water won’t be cleaned through the filter so with the rising temperatures, you’ll need to fix it quickly. The debate ensues, “Is it worth it to repair my pool motor or should I just replace it?” and the answer is going to depend on your specific situation. If you live in Scottsdale, the continual use of the pool motor year round might mean you have to repair it more often so you'll want to weigh whether it's more cost efficient for you to replace a few parts yourself, if you're the handy type, or if it's best to call a pool technician to fix the issue or complete a full motor replacement. We know a broken pool pump is already a hassle so here are some tips below to help you make a quick, more informed decision. Do You Know the 'Age' of Your Pool Pump Motor? The ‘age’ of a pool pump motor is relative to usage and how exposed it is to the elements, not necessarily the actual age in years. So Scottsdale pool pump motors are going to be ‘older’ than say the same pool pump in Chicago. Why? Because the pool pump motor runs every day of the year here in Arizona and endures extremely hot summer temperatures so it is going to wear out faster. So even though you bought a motor just 3 years ago, the motor has had to run a lot longer than if you lived in a cooler climate. There are ways to help increase the life of your pump motor which include constantly checking the pool water levels so that you never run the pump dry. Also, do not run the pump all day unless there is a green pool situation that needs to be cleared up. Pool water only needs to be turned over once a day so depending on the size of your pool, your pool pump should only run about 9-12 hours a day. We usually suggest running the pump in the evening since electric costs are a little lower at night and you won’t be using the pool while the pump and filter run. If you’re not sure how big your pool is or how long you should run the pump, we are always happy to come take a look and help answer these questions. Depending on the parts needed, the ‘age’ of your pool pump and your personal skill set it could be less expensive to repair or replace a pool pump yourself by researching online to get the correct parts and heading out into the Arizona sun. However, if you don’t know much about pool equipment or aren’t looking forward to working on the pool motor in 110+ degree heat, then you may want to call a pool professional who can confidently diagnose the problem and offer you options to repair a few of the motor parts or can definitively tell you that the motor is shot. Replacing a pool pump motor for your in-ground pool can run about $200 for the new motor itself and it is always important to replace the shaft seal (about a $15 part) so that you ensure a proper fit on the new motor to avoid water leaking into it. That seems simple enough, but, what about horsepower and your pool filter size. 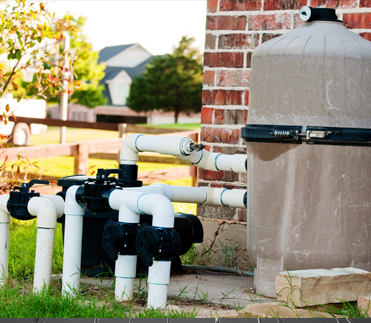 Is your pool pump too big for your pool or your filter, is it too small? These are important things that your local pool technician knows so that you don’t end up buying the wrong motor size and costing time and money in the long run. So we suggest at least getting a professional opinion before you start your own pool pump repairs! Remember, we are always here to offer our full pool repair and replacement services and give you solid advice on what is best for your pool. We understand that a backyard pool is your haven during these hot summer months so don’t hesitate to call us with any pool issues so we can help answer some of your questions by phone or send our trusted pool techs to you so that your pool stays clean and clear all year!